Do you need definitions for criminal record background checks and civil background searches all in one place? Public record searches are among the most used background screening service industry wide, especially for a criminal background check. From commonly used industry terms to various court decisions, hiring managers frequently need a resource to interpret these results. 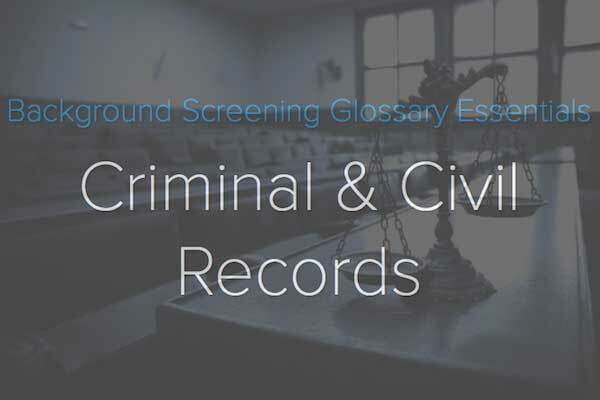 Here’s your best source for terms related to criminal records and civil searches - all are taken directly from our full Background Screening Glossary. Use this quick reference for the various criminal and civil record searches provided by Choice Screening as well as related terms. County Civil Search – Civil record research sourced directly from county court files. County Criminal Search – Criminal case research sourced directly from county court records. DOB (Date of Birth) – Arguably, one of the most important pieces of information on a background report request next to full legal name. Most records (criminal, civil, employment, and education) are filed by name and DOB as opposed to other identifiers, such as SSN. International Criminal Search – A jurisdiction-based search (ex. city, country) for criminal records outside the domestic US. Search Scope – Defines a background screening service in terms of time, location, source and/or information retrieved. For example: 7-year, County Criminal Search, Convictions Only, in Denver, Colorado. Statewide Criminal Search – Aggregate of criminal record data within a specified state. Reporting practices vary so many states are recommended to pair with a county criminal search. US Federal Civil – Search of all 94 federal courts for civil disputes filed in the federal court system including, damages exceeding $75,000, party/citizen disputes that cross state lines, bankruptcy, patent, antitrust and cases where the US is a party. US Federal Criminal – Search of all 94 federal courts for criminal records where Federal courts have jurisdiction. Verified Enhanced National Criminal – Same as the Verified National Criminal, however, the Enhanced search includes address history, alias names and searches these alias names for criminal records. Verified National Criminal – Nationwide search of over 1,000 criminal record sources and over 525 million criminal records based on a single name. It is every user’s responsibility to know and understand the laws surrounding background screening. Reference common legislative trends and regulatory agencies below. Ban-The-Box (BTB) – Social movement focused on removing the “check box” from a job application that requests disclosure of criminal history. Fair Chance Act – Common name used for much of the legislation related to criminal record restrictions and credit reporting restrictions for employment and pre-employment background checks. Legislation varies by jurisdiction; refer to legal counsel for applicable legislation in your area. Hiring Matrix – A tool used to compare job requirements to an applicant’s qualifications used to aid in making a hiring decision. Individualized Assessment – Taking into account additional information about the individual and criminal record before making an employment/hiring decision. Do you want these and other terms related to general background screening, compliance, drug screening and Form I-9? Here’s a list of our most common criminal and civil terminology. Keep this list handy when using public record searches in your decision making process. Adjudication, Adjudicated – Occurs when a decision is made by the court in a criminal or civil case. Adjudication Withheld – Court decision that does not result in formal conviction pending successful completion of probation. Alias Name – Alternate name that an individual has gone by or is associated with, such as nickname, associated name, maiden name or former legal name. Arrest Warrant – Also known as a criminal warrant. An official court document that authorizes a police officer to arrest the individual(s) named on the warrant. Bench Warrant – Official document issued by the court when an individual was ordered to appear in court but failed to do so, is held in contempt or is charged with a crime. Bound Over – A case that is sent to another court to continue with proceedings. Clerk Delay – Delay caused by the court clerk retrieving and verifying a court record search request. This is the most common delay impacting criminal and civil record searches. Concurrent Sentence – Criminal sentences that are served at the same time. Consecutive Sentence – Criminal sentences that are served back to back. Conviction – Adjudication of guilt in a criminal case. Deferred Judgment – When the defendant enters a guilty or no contest plea before the court and the sentence is placed on hold, or deferred, until a later date. Also commonly referred to as Deferred Adjudication and Probation Before Judgment. Deferred Prosecution – When a defendant is required to abide by agreed upon conditions prior to submitting a plea. Deferred Prosecution is not considered a conviction while under deferment. Dismissed – Court decision in which the charges against a defendant are dropped. Dismissed With Prejudice – A case that has been dismissed and cannot be filed again for the same matter. Dismissed Without Prejudice – A case that has been dismissed, but can be brought again regarding the same matter. Expunged – Files that are completely removed from public record, either by destroying the file, returning the file to the petitioner or removing all information pertaining to the petitioner. Grand Jury – A jury that determines the validity of an accusation, but does not try or decide the case. Guilty – Court decision that finds an individual responsible for wrongdoing. Guilty in Absentia – A decision of guilt in absence of or without requiring a court appearance. Identifier – Personal information used to match a record (criminal, civil, medical registry, school transcript, etc.) to the subject of a background report, such as name, DOB, address, etc. Jurisdiction – Most often, the geographical area in which a case was held (criminal or civil). Jurisdiction may also be assigned to certain types of cases, such as county court jurisdiction versus district court jurisdiction. No Contest (or Nolo Contendere) – A plea made by the defendant that is not an omission of guilty but is conceding the charge without presenting a defense. This primarily effects how the case is used and viewed in the judicial system and can be treated the same as a conviction for background screening purposes. Plea – A defendant’s formal statement in response to criminal charges – guilty, not guilty, no contest, etc. Prayer for Judgment – Common ruling in North Carolina often reserved for low-level crimes and infractions where the defendant pleads guilty but the court does not enter a conviction. Sealed – A record that is not removed from a defendant’s file, but is “hidden” from public access. These records are available only to law enforcement and the court. Others, such as an employer, can only receive and use the record if permitted by law. Suspended Sentence – A sentence that is ordered by the court but not imposed at the time it was handed down. User Certification – Provision in the FCRA that states a CRA may only furnish a consumer report if the user has affirmed its compliance with the FCRA and applicable laws, including but not limited to only using the provided background report for a specified purpose. Warrant – Order of a court or law enforcement issued when an individual failed to appear in court, is in contempt of court or has an outstanding balance of fines owed. The information contained in a criminal or civil matter often changes by jurisdiction, or even level of court. If you encounter a term that is throwing you for a loop, make sure you give us a call to clarify. Background screening is most successful when the company behind the report is as committed to quality as you are! Do you have any more questions? Leave a comment below or contact us!